Sunday Meditations - Feeling Stuck? Rearrange Your Cells! . . . 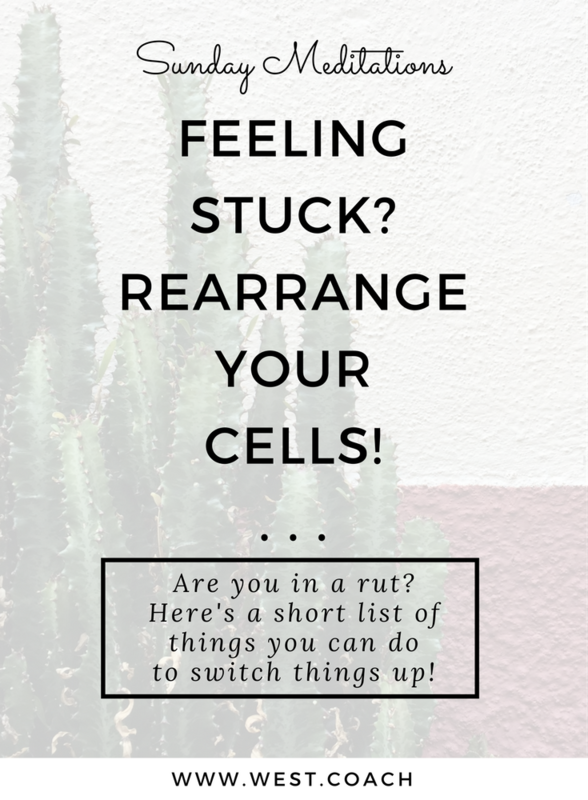 I was talking to my BFF the other day about feeling stuck, and she said "You need to re-arrange your cells!" Wait Whaaaa?
. . . become a runner, and run a marathon. <--- !!
. . . overcome her fear of heights and joined her son for an epic sky-dive out of a plane.
. . . gone to work at her local high school as a para-educator in a class for special needs kids. Basically she's totally amazing and lives and breathes her life in a way that always has me inspired. So when she told me I needed to "re-arrange my cells", I Listened! MOVE! - Of course the first thing that came to mind when I heard "re-arrange your cells" was to move my body! I don't have a particularly good exercise routine in place right now - but twice a week I am a dog-walker and get to hang out for an hour with some of my favorite furry neighbor friends. And I get paid . . . Winning! I do have plans to add more to my weekly exercise routine - but for the time being I love this time that is set aside for my dogs, and can't help but think about how my cells are actually rearranging themselves as I take them around the neighborhood. GO OUTSIDE! - Fortunately for me my exercise gig also requires that I be outside . . . but heck you don't have to be exercising to enjoy Mother Nature! Yes it's been bitterly cold in the Pacific Northwest for the last month or so, but hey if you're in a warmer climate? Go for a hike, find a new park, or head to the beach. Even 30 minutes outdoors is a great way to feel rejuvenated. SING! - Another way I like to think of my cells moving around is by . . . singing in the car! You may or may not know that I am a closet country music fan, and few things make me happier than having the country music station on in the car and chiming in loudly. There's something about the vibrations that literally makes me happier. It's a THING! MAKE! - I can't say enough about moving away from the crazy world we are constantly influenced by in our screens, and going to make something! Lately my making has been in the form of healthy meals in my new Instant-Pot (there may be a dedicated blog post coming about the love affair with my new appliance! ), and knitting hats - but whatever it is that brings you that makers-joy . . . do it! TRY NEW THINGS! - It's been proven when you try new things that it literally creates new pathways in your brain. This is one of my favorite topics, and lest you think that trying new things cost lots of money . . . that is just not the case! Some of my go-to free ideas are writing love-notes or letters, and taking new ways when driving to work or going for your daily run. Switch it up! And there you have it! While I can't guarantee radical cell-rearranging results, I can say with some certainty that you won't regret trying and of these things, and you might actually really love them. Action creates Motivation creates Inspiration. <---- WOOOOW! Are you feeling stuck? Do your cells need a little re-arranging too? Give some of these tips a try and let me know how they work by sending me a note or leaving a comment. p.s. Want to get a little more magic in your inbox? Sign up for my email list below!